I apprecite tulips. I enjoy seeing colourful massed displays, but I'm not overly enamoured of them in my garden, partly because they need to be lifted each year and replanted in Autumn or early Winter. I admit I purchased my Tulipa kaufmanniana 'Heart's Delight' from Lambley Nursery because the accompanying information stated that they can be left to naturalise. I read that these tulips originated in Turkistan where they grow in the wild and they were introduced in to Europe in 1877 by a Dutch company-of course! I think they are not particularly well-known here in Australia. 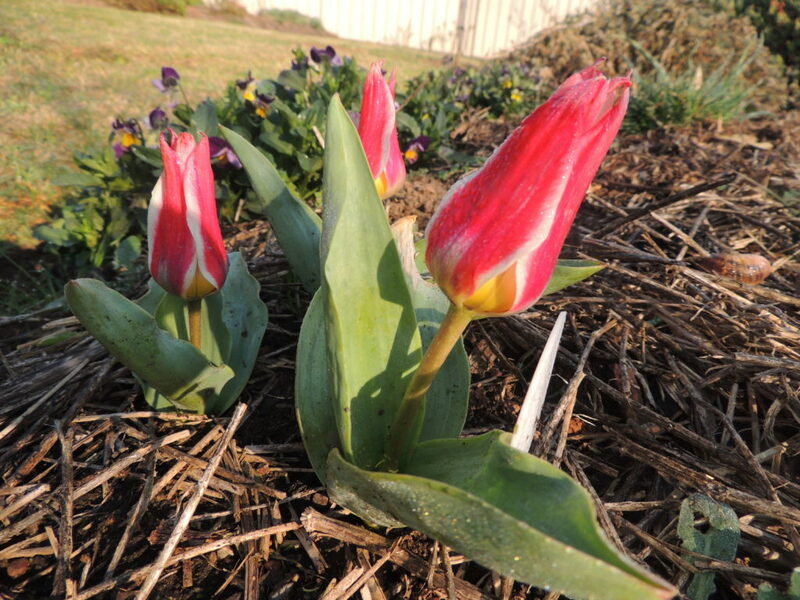 I was completely unprepared for the pleasure these small tulips have provided in my early Spring garden. They are only about 15 cm tall at the most but what they lack in size, they more than make up for in impact. Every evening the petals close up completely, furled protectively around the inner parts, showing their cerise-coloured undersides. As the sun rises, they begin to uncurl. It's almost possible to see it happening. I feel if I had the patience, and a comfortable seat, I could watch this greeting of the day, as it occurs. Finally they open fully and display the inside of their creamy petals, butter yellow anthers and scallops of pink. No wonder that this tulip is called 'Heart's Delight'. It has captured my heart for fully a week. Previous Post SoS: September 1: Still frosty. I love tulips too. 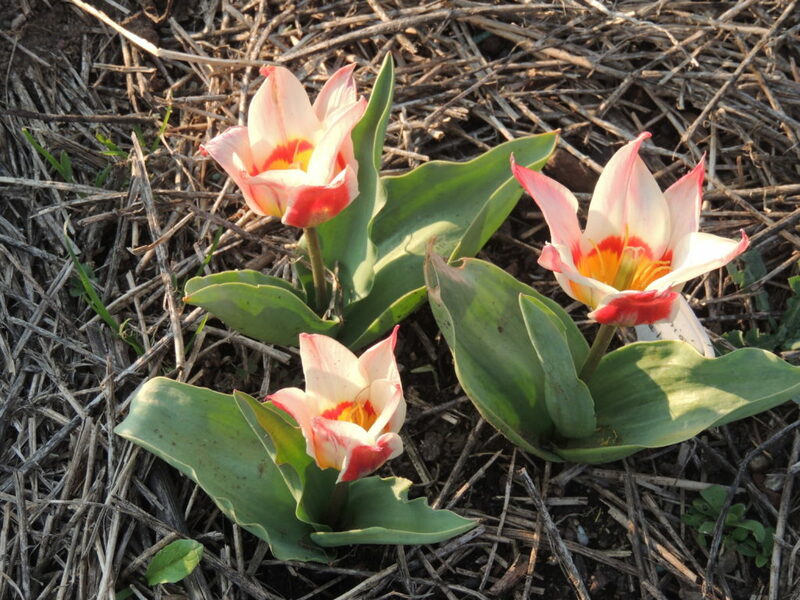 I had the pleasure of seeing wild tulips on the steepe in Kazakhstan and many were short like your beauties . That must have been quite an experience seeing those tulips in their natural habitat, Cathy, and also visiting such an interesting place. I worked there for a few years but I only saw the steepe in spring time a few times, as travel was so difficult. Your tulips looks gorgeous! We intend visiting Lambley nursery, as one of our daughters lives in Melbourne (we are in Canberra), so the next time we are heading to Melbourne, I’ll try to get some “‘Heart’s Delight”. I do have some red tulips that faithfully came up for a few years, but as you say, remembering to lift them is a problem. Thank you, Gerrie. Yes, you should definitely visit Lambley. It was a highlight of our trip to Melbourne in Autumn this year and I’m sure it’s even more exciting in the Spring. A ‘delight’ for the heart, furled and unfurled. Isn’t it a marvel in nature that the underside of petals differ so markedly from the top sides? Wonderful thoughts Jane, makes the heart sing to observe such beauty. Indeed, Liz, there’s so much to enjoy in nature. Thank you for your delightful comment. Happy Spring to you! Thanks for your lovely post Jane. These are absolutely exquisite and I’ve never heard of them! I’m so amazed they close up at night and open anew in the morning, sounds magic! Yes, I didn’t know the closing up and opening would happen either. They are lovely, Liz and I hope they multiply like mad! The opening and closing was a revelation to me too, Liz, and was fascinating to watch it happen albeit in ‘single shots’. This is when I need a time lapse camera! So wonderful to see them! I’ve never grown any of the kaufmanniana types – wish now I had! Lovely pictures! I did grow some greggiis – Red Riding Hood and Cape Cod. I always found the rabbits were less likely to chew them up, and I’ve never had the least idea why. Any additional data on rabbits and species tulips much appreciated…! 😉 But my favorite species is the dainty but brilliant T. clusiana var. chrysantha. I have even planted some here, and it did bloom this last spring, albeit a bit wimpy-looking compared to the way it bloomed in my cold-winter garden! Hello Amy, many thanks for your comment. I read that kaufmanniana are poisonous to humans, so perhaps rabbits would be less likely to eat them. I also have some Tulipa clusiana growing-‘Lady Jane’- which has just flowered and it’s lovely, although in a quieter, paler way. I researched your chrysantha…it’s much more colourful. Maybe I’ll look for some of those next Autumn. The species tulips sold out very quickly at my favourite online nursery! It’s hard to name a favourite when there’s so much beauty, Derrick. Meantime I shall enjoy looking at yours, and yes these are very beautiful. One of my favourites is Ballerina – an elegant lily-flowered orange lily with a gentle fragrance. Another (which looks good planted with the above) is Paul Scherer, a classic shaped tulip with a velvety maroon black which looks like the colour of blackberries. Oh yes, Ballerina is very lovely, not easily found here (I just looked online) and I can see why it’s a favourite of yours Jude, and ‘Paul Scherer’ is deliciously dark, even more so than ‘Queen of Night’ whose appearance I’m anxiously awaiting. Of course, to really make an impact, many more are needed which is why I like the idea of bulbs that naturalise. These are unknown to me but both fascinating and beautiful; love your description. May have to get some! Unknown to me as well, until this year, Diana. I’ll certainly be getting some more! Your tulips are so pretty. I have to enjoy others’ tulips, as they don’t grow here. Oh, that’s the lot of the gardener isn’t it! I often long to plant things I see on other posts, but can’t because of the climate. Usually cool woodland type plants. I began experimenting with species tulips last year (T. hageri ‘Little Beauty’), in pots initially. After they bloomed I planted them out in the garden so we’ll see if they return. Mice are my problem here, as well as rabbits. I shall probably try planting something else this autumn. If kaufmanniana are poisonous that sounds a very good place to start! I hope your T. hageri return Jessica, because they’re very pretty and a lovely colour. We don’t have anything that eats bulbs as far as I know, so I hope mine return. I’m sticking a label in the ground so I don’t plant anything on top of them while they’re dormant, which is something I’m quite often guilty of doing! What a sweet post where you have captured the essence of spring and the wonder it brings. Enjoy every minute of it. Thank you so much, Cindy. Spring is such an exciting time in the garden, especially when it’s the first time you’ve ever seen a particular flower bloom! Jane, these tulips are lovely and will be even more so when they begin to spread. I don’t grow them either. It’s too warm here and they don’t last long. Thanks Carol. I’m thinking I’ll be buying more to help with the spreading! There’s been quite a bit of admiring around the garden with or without chairs, Tracy. This is pretty much the first beginning of spring we’ve been present for since we bought this house four years ago, not counting the first year when there wasn’t a lot in n the garden to admire. I grew up thinking tulips were all yellow and all the same shape, like the pictures in story books about Holland. Then I accidentally came across the Table Cape Tulip Farm in the north of Tassie. Couldn’t believe all the different colours and shapes. So beautiful. Hello Coral, thanks for mentioning the Table Cape Tulip farm. I’ll have a look at it online. I’m having a tulip revelation just now…could be dangerous and expensive! I agree with you totally! They are such a pain to dig up and store, otherwise I spear them at some point in the year, or disturb them, or they just get in the way. I do love the little species ones, yours are adorable! I often plant something else right on top at some other time in the year….hopefully putting some labels in the ground (something I’ve never done before, the reason I don’t know the names of a lot of my plants) will sort that out. I have many ‘favourite’ tulips; actually I love nearly all of them. I never need to lift them in my climate as they are happy with no rain or irrigation in summer; it is summer wet they hate. I would imagine in your climate you shouldn’t need to lift them either, unless you irrigate heavily throughout summer. My tulips bulbs have just arrived and I’ve put them in the fridge to have an early flowering. Tulips need 10 to 12 weeks of about 8°C to flower well. I think that decides it then, Christina. I’m leaving my other tulips in as well! We certainly get plenty of cold during the winter and don’t really need to put the bulbs in the fridge. I’m assuming you mean 8 degrees overnight, not during the day! That would certainly be something to remember, Vicki. Lovely tulips and great photos of them. I’d like to try a few of the species that are said to survive in the Southern California climate. Here we have great success with South African bulbs because the climate is so similar. Other good results from Hippeastrum hybrids and some native California bulbs as well–Brodiaea laxa has come back faithfully for 18 years with no irrigation and no care. Drimia maritima from the Mediterranean also perfect for this climate. Thank you hb. 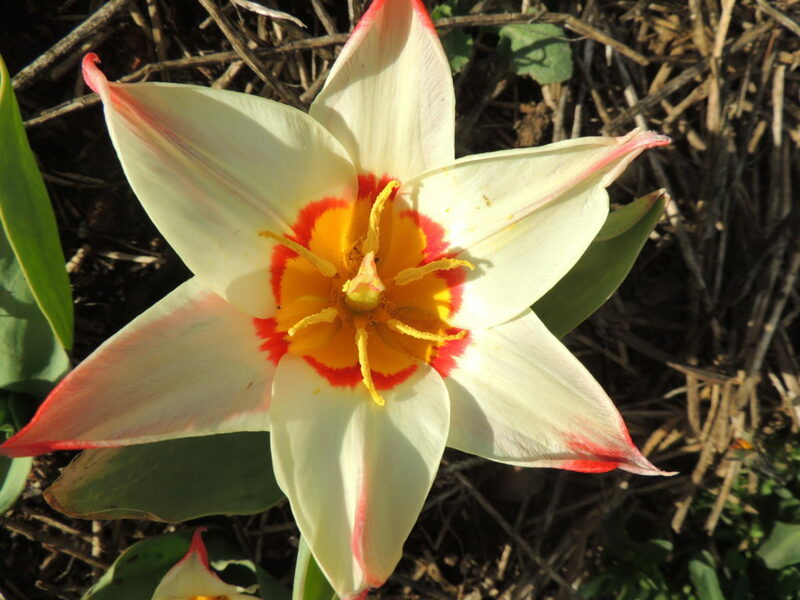 I think species tulips would do well for you- certainly worth a try. South African plants do well here too. You’ve introduced me to two new plants: Brodiaea and Drimia. Brodiaea is a most stunning blue. Now, where can I get those……. Jane I love tulips! BUT, it is so hot here they last less than a week! I would really like your tulip in a nice cottage garden in the UK! A cottage garden is a lovely thing…. It’s very hot here in the summer, so it will be interesting to see whether my tulips cope. Time will tell. They’re gorgeous, Jane! I love tulips but they NEVER do well here. That said, every few years, I fall prey to their charms and give them another try. Only the so-called species (rock garden) tulips have ever returned for me (e.g. 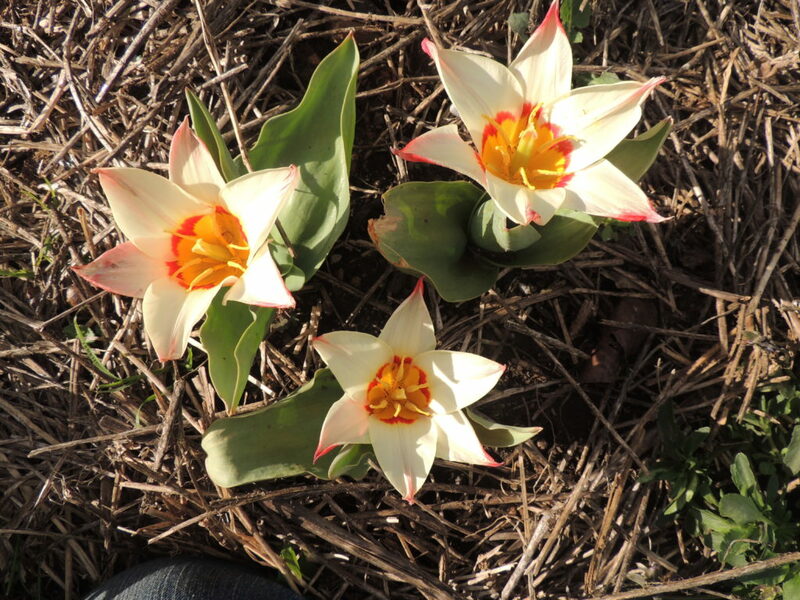 Tulipa clusiana, T. bakeri) and, even then, in steadily decreasing numbers year-to-year. I haven’t seen this particular variety before but I shall look into it! It’s my first year with them Kris, so I’ll have wait to find out if they survive or not. I have planted t. clusiana as well and it’s flowering beautifully. I’m sorry to hear yours decreased- perhaps that will happen here too. A lot of gardening is experimental, isn’t it….finding out what suits one’s particular climate and soil.